In this relentlessly mournful récit, Vincent de l’Etoile, a youth of godlike beauty and initially confused sexuality (who is, at age 16, “as old as the century”), reveals his chance friendship with a middle-aged author named Marcel and his passionate love for Arthur Valès, a doomed soldier. Besson’s restraint provides several plaintive moments, but conversational, epistolary, and ruminative banalities abound, and even a subtly prepared surprise climax fails to interest us much in his gallant sufferers. 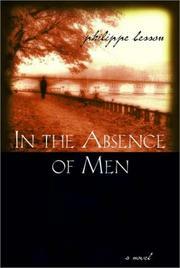 Absence so far has been compared to Michael Cunningham’s The Hours. It’s more akin to Françoise Sagan’s once-notorious Bonjour Tristesse.